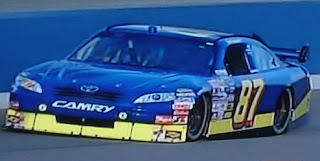 Joe Nemechek picked up his 14th career last-place finish in Sunday's Auto Club 500 at the Auto Club Speedway of Southern California after his unsponsored #87 Toyota fell out with a fuel pump failure on lap 36 of the 250-lap event. After coming just one spot shy of making the field for the Daytona 500 the previous week, Nemechek made the field for the Auto Club 500 with a qualifying speed of 177.998 mph. The run was just good enough for him to beat 5 other go-or-go-homers and secure the 43rd spot. In the early stages of the race, Nemechek gradually moved up into the 30s, but came down pit road under green on lap 36. His crew lifted the hood on his Toyota, then pushed it behind the wall. The fuel pump had failed, forcing the team to call it a day. It was the first time the last-place finisher was knocked out with a fuel pump problem since Joe Ruttman in the 1982 Firecracker 400 at Daytona. The run was Nemechek’s third last-place finish at the Auto Club Speedway, his second-straight at the track, and his first since last fall's Tums QuikPak 500 at Martinsville. Half of Nemechek’s fourteen last-place finishes have all come in the last three seasons. Nemechek’s NEMCO operation had not finished last since Ron Fellows fell out early in the Global Crossing at the Glen in August of 2000. It had been just over a year since the #87 had previously finished last: Kenny Wallace did so driving as Nemechek’s teammate in last year’s Daytona 500. Joey Logano picked up his 1st career last-place finish in Sunday's 51st Annual Daytona 500 at the Daytona International Speedway after his #20 Home Depot Toyota was involved in a single-car accident on lap 79 of the rain-shortened 152-lap race. Logano had a difficult SpeedWeeks coming into the 500. He crashed out of the Budweiser Shootout the previous week and struggled with his car’s handling in practice. Despite this, Logano ran very well in Gatorade Duel Race 1 on Thursday, finishing 4th. The run gave him the 9th starting spot for the Daytona 500, but he struggled near the back of the pack as the race progressed. Hovering around 27th on lap 79, Logano entered the tri-oval behind fellow rookie Scott Speed. When Speed got loose, Logano turned left and crossed the nose of Greg Biffle on his inside. The contact sent Logano’s Toyota head-on into the inside wall just before the entrance of pit road. His car then slid back into the infield grass and came to a stop, bringing out the fourth caution of the race. Logano was uninjured. With the finish, Logano became the first driver ever to finish last in both the Budweiser Shootout and the Daytona 500 in the same year. It was the first time the #20 had finished last in the Daytona 500 since 2007 and the first time the #20 had finished last at all since last year’s UAW-Dodge 400 at Las Vegas. 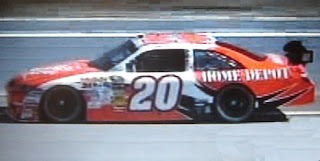 Both those finishes came with the car’s previous driver, Tony Stewart.